If there’s one thing the merc with a mouth loves almost as much as Bea Arthur, it’s a good chimichanga. Or even a mediocre chimichanga. Preferably Cable’s chimichanga, served by Bea Arthur. There are as many ways to make a chimichanga as there are kids living at Xavier’s mansion. This one is made with beef, because cows are jerks. Prepare the boiling oil! You want it to reach 350 degrees of lethal goodness. While that heats up, brown your beef along with the onions and garlic. Drain off the delicious fatty juices. Mix in the tomato paste, cumin, oregano, celery salt, and regular salt. Pile ⅛ of the beef mix on a high fat, nutrient free tortilla. They stick together better. Top it with some cheese to give your chimichanga the best chance of burning your mouth on the first bite. Fold the sides in and then the top and bottom down. Really, just roll it like a burrito. If you don’t know how to roll a burrito, kidnap someone who does. Use your water soaked toothpicks to nail the edges closed. Fry for 3-4 minutes per side, or until golden brown. If you’re fancy, serve your chimichangas on a bed of lettuce, topped with picante sauce and sour cream. If you’re in a hurry, shove the molten chimichangas into your face fresh from the fryer. If you’re under attack, it’s a good thing you have that boiling oil. 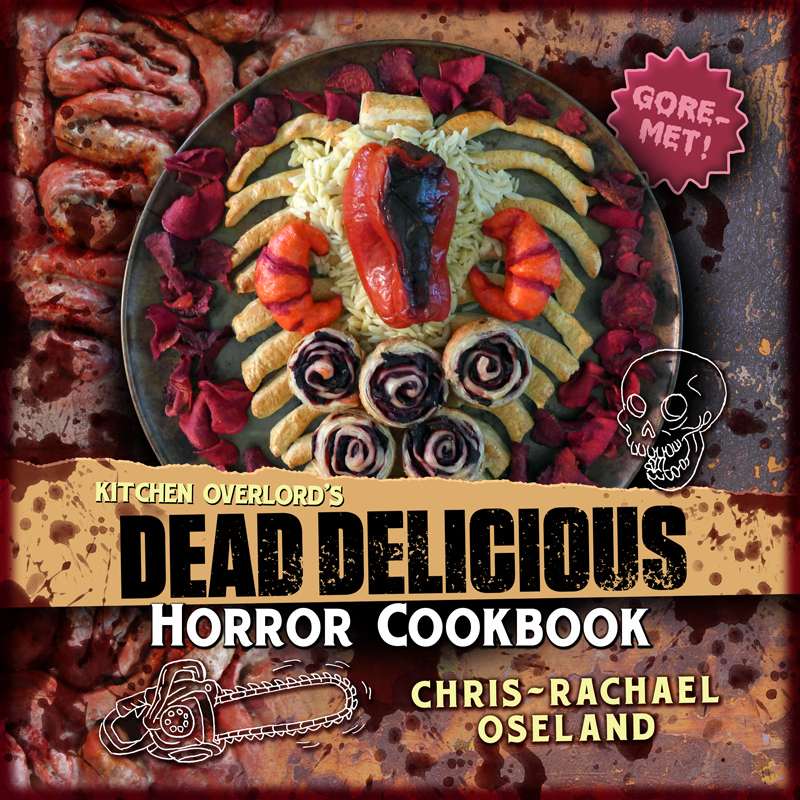 Kitchen Overlord’s Illustrated Geek Cookbook includes the Merc with a Mouth’s home made Chimichangas plus nerdy recipes from 50 other fandoms. Or check out the links below for even more Deadpool themed recipes! Well I know what I’m making for dinner. I have both of your cookbooks and am dying to get the third! I have Unexpected Cookbook and Kitchen Overlord. As a MEGA fan of Mystery Science Theater 3000, I want to thank you for putting Servo on your cookbook cover. Tonight, I made your Sandworms Tart and it was a major hit in our Seitch this evening. Even my husband, who seems to think he doesn’t care for sweets, had 3 slices for dessert, then went back before for another slice before going to bed! I really want to make the big Sandworm bread next!! 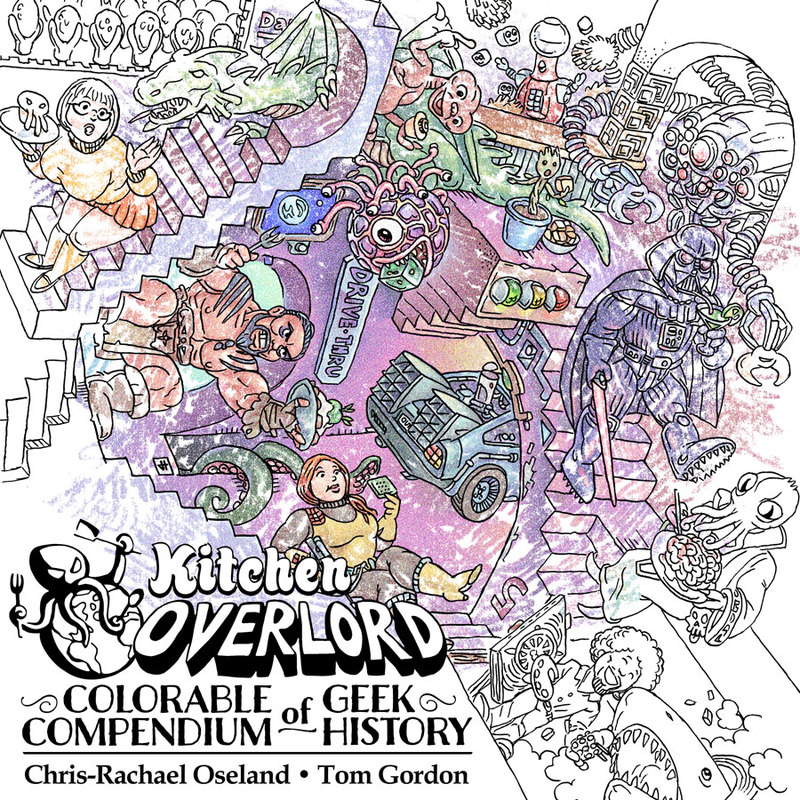 I have one question on the cover of your Kitchen Overlord Cover…the girl wearing glasses coming down the Escher steps with a green dragon behind her, is that Thelma from Scooby-Doo?